The first French invasion of Spain had ended in failure, but the Spanish, without a functioning high command, failed to coordinate an advance by the closest Spanish armies to take advantage of the temporary weakness of the French position behind the Ebro River. French Marshals Bessières, Victor and Ney, knowing that Napoleon was on his way, chose not to act. Marshal Lefebvre, hungry for glory, observed that Blake’s Spanish ‘Army of the Left’ was vulnerable to attack. 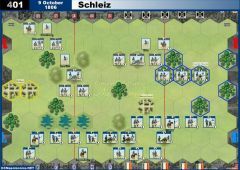 On October 31st Lefebvre launched a ferocious three-pronged attack on Blake’s army as it was drawn up in front of Zornoza on a range of low hills. At first the entire Spanish line retreated to the heights of San Martín, but soon afterward, the Spanish center disintegrated. Blake reacted quickly, and ordered his two wings to retire and cover his center. Blake’s army then retreated in good order. Lefebvre’s premature attack at Zornoza, coupled with Blake’s rapid retreat, compromised the northern part of Napoleon’s plan for a grand double envelopment of the Spanish armies. 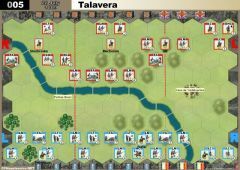 • Ordered Spanish units may move off the Spanish edge of the battlefield. 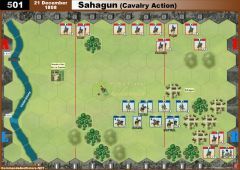 After three ordered Spanish units have moved off, the Spanish player will gain one Victory Banner for each additional ordered Spanish unit that moves off the Spanish edge of the battlefield. Spanish Leaders that are ordered and are moved off the Spanish edge of the battlefield will not count as a Victory Banner for the Spanish player, but their exit may prevent the French player from gaining banners for their elimination if they remain on the battlefield. • The Spanish Guerrilla Action rule is in effect. 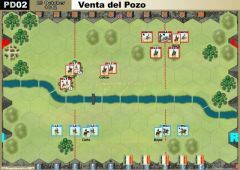 The Spanish player does not start the battle with any Guerrilla counters. I have played 4 games with Sp banners for each unit exited after 4. Right now, 2-2 with a total of 19 total banners each. If you are looking for a "fair and balanced" scenario, this may be it. Be advised that cards like Force March, Bayonet, and La Grande Manuever will impact this scenario more than most. Strange that the Spanish have 4 leaders to the French 3. I played with Bayern's SP victories start to accumulate after 4 exited units. Fr won first game 6-2 but lost 2nd 5-6. 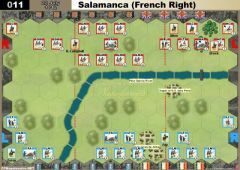 Love the tension between The French being too aggressive and having their "heads chopped off" and the Spanish caught between exiting units or staying in formation to kill advancing French columns. Thanks Mark G for your notes as well. Thanks for the notes Bayernkini on this scenario. Great if you publish your Sp Win versus Br win. Just started with a friend, to revise all outbalanced scenarios. The intention is, to change only less and small things, if possible. So this scenario is the first, we played today a lot of time. We kept the original setup and the only small change was, to get the spanish Exit VP after the 4th unit, instead after the 3rd. 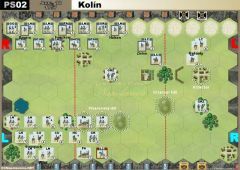 • Ordered Spanish units may move off the Spanish edge of the battlefield. if they remain on the battlefield. Here are 2 pics of one of our game, which was a really nice and funny situation at the standing of 5:5. 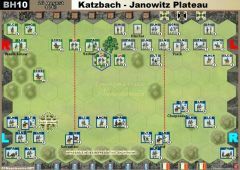 The spanish had only 1 block LT left on board and his next 2move would been his victory. 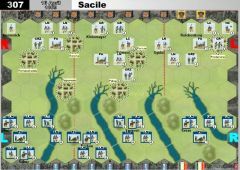 On the other side, the french had no card to order and battle the near units. 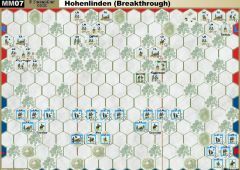 So the french had fortunately a LGM card, which allowed to block all escape paths of the spanish LT, so the spanish couldn´t use his next order to move this unit from board and the french could destroy this last block vor victory. the French can substitute 1 LT for an LN in the Centre and the Left. This corresponds to the French divisional compositions. Lefebvre's IV Corps included three infantry divisions and 36 cannon. Major-General Horace Sébastiani's 1st Division contained the 28th Light and 75th Line (3 battalions) and the 32nd and 58th Line (2 bns.). Maj-Gen Leval's 2nd Division was made up of the Dutch brigade and 2 bns. each of the 2nd Nassau, 4th Baden and Hesse-Darmstadt Gross-und-Erbprinz Regiments, and the Paris National Guard and Frankfurt battalions. Maj-Gen Eugene-Casimir Villatte's 3rd Division included 3 bns. each of the 27th Light, 63rd, 94th and 95th Line. I have to think the fix to this scenario involves French cavalry. Even Light Infantry would be better. 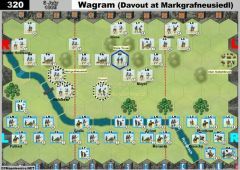 Pursuit with Line Infantry is just not feasible. Maybe upping the Spanish exit requirement to 5 before the units start to count might work too. this is one of the suckiest C&C scenarios I've played. Spanish march off the map, French pursue with Line Infantry. Every banner puts the Spanish closer to the edge. 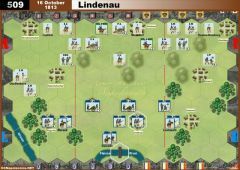 No, like in others games from Richard, the unit has to be ordered to quit the board as it is said in the Victory conditions. The 1st was in only one way (cards and dices for the same guy : me ! So my opponent stayed very disappointed). gaining banners for their elimination if they remain on the battlefield. 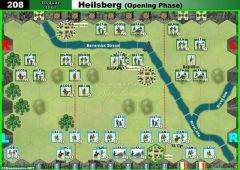 combat, count These units also to this rule above?